The ulnar fovea sign is a clinical test used to specify the cause of ulnar-sided wrist pain. The ulnar fovea sign test can form an important part of the objective examination when the patient has complaints about the ulnar side of the wrist. It is a provocative test to give the patient an irregular soreness in the fovea region of the wrist. The ulnar fovea sign is not utile on patients who have global soreness of the wrist. It is at the most utile in a symptomatic patient who has no other clear evidence of pathology in the wrist and who continues to suffer pain despite affective nonsurgical interventions and for whom wrist arthroscopy should be the following examination. The mechanism of injury for foveal injury is excessive traction of the ulnocarpal ligaments, elicited through hyper-radial extension or hyperextension of the wrist in combination with axial loading and/or forearm rotation. This mechanism transcribes forces at the fovea region. When the ulnotriquetral ligament suffers to an extreme traction, the ulnar styloid attachment will break down before the foveal attachment does. In the research “The Ulnar Fovea Sign for Defining Ulnar Wrist Pain: An analysis of Sensitivity and Specificity” was the ulnar fovea sign positive in 156 patients. 90 patients received the diagnosis of foveal disruption and 68 patients of UT ligament injuries. So two patients had a positive ulnar fovea sign, but none of the two possible pathologies . 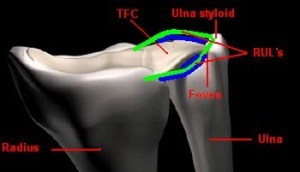 The fovea is situated between the ulnar styloid process and the flexor carpi ulnaris tendon. Ligamentous structures in the fovea region when the forearm is in a neutral position form the foveal attachments of the conjoined palmar and dorsal radioulnar ligaments and the ulnocarpal ligaments. For the purposes of this test, the patient is facing the therapist with the elbow on a table or plinth. The elbow has to stay in 90° to 110° of flexion with the forearm and the wrist in a neutral position. The thumb of the therapist has to be pressed deep into the soft space among the ulnar styloid process and the flexor carpi ulnaris tendon distally, between the palmar surface of the ulnar head and the pisiform. A comprehensive wrist examination should be completed in conjunction to the fovea sign test in cases of ulnar-sided wrist pain. Objective components should include active strength in all functional movements, grip strength and range of motion of the wrist and forearm pronation and supination. When a positive ulnar fovea sign is established there is a possibility of two wrist conditions, the longitudinal split tear of the ulnotriquetral ligament and foveal disruption. A positive ulnar fovea sign test has either a stable dorsal radioulnar ligament joint or an unstable dorsal radioulnar ligament joint. When it’s unstable, a longitudinal split tear of ulnotriqutral ligament is the probable diagnosis. When the stable dorsal radioulnar ligament joint is present, the probable diagnosis is foveal disruption . The difference between the two conditions is made clinically, radiographic or with a CT scan.